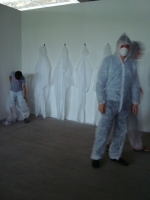 The “Filters” performance is inspired by the theme of travel, of movement and of migration from one place to another, and by the subsequent increase in the filters used for checking people and containing the spread of diseases, with special regard to the problem of pandemics. Which is the new border of the future? There won’t be more geographical, political or religious borders, the future border will be the same individual, everybody will be the border of themselves. The danger of pandemics projects each of us into total isolation where everyone could be a potential danger for society. In the near future our security or insecurity will no longer be determined by cultural or religious differences. Each of us could be a potential social danger simply by having a slight temperature. Every day, in airports and at the borders of the countries which are most at risk (Taipei, Hong Kong, China etc) we take part in checks which are ever more sophisticated and complex, such as measuring body temperature with X-rays, antiseptic mats to disinfect shoe soles, the use of masks and goggles, disinfectant sprays for cars, etc. 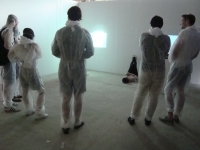 Inspired by the feeling of precariousness and solitude which is induced by the new filters to protect us from pandemics, the “Filters” performances will “filter” the visitors before they can take part in the sound and video show. Before they can enter the space where the sound show is held, visitors have to walk along a pathway, which could be inside or outside, and along which they are “filtered”. They were invited to tread on disinfecting mats, to put on masks and then paper overalls. We measured temperature of their body and took their fingerprints. 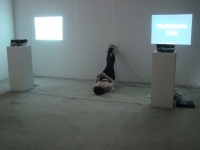 After being subjected to all these filters the visitors were finally be able to participate in the sound/video show created by the performer Wen Chin Fu, who play an instrument of her own invention, and the video projection of Maria Rebecca Ballestra.